Frances (of Faire Garden) made me think - well, everyone did. Why am I this cross about autumn colours? especially the glorious oranges and reds and wonderful golds which I see in some people's photos. Shshshsh . . . it's because I don't have any. There are other reasons. Aesthetic ones. None the less - I must admit - I'm jealous. 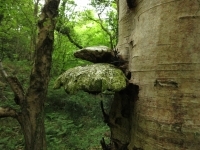 I wouldn't swap my sycamore leaves for them, even though. For tramping in - Sycamore leaves are the best. They drift into convenient piles and, if you scatter them . . . even if you throw them in the air so you can watch them fall all over the place, come the slightest gust and they' ve all whooshed back to where they started, ready for the next person to wade through and toss. They don't smell unpleasant either. Nor do they rot too early on the pavement. The rains rain but they dry out soon. And they curl at the edges . . . and fold in on themselves . . . so they go a long way when you're wanting a huge and wonderfully satisfying pile. Sycamores aren't the only trees round here. But leaves from the others fell off too quick - when I wasn't looking - and I don't know where they've gone. One minute they were there - and then they weren't! Quick as that! And we're left with the Holm Oaks; lot's of them. Personally, I think they have a nerve, calling themselves Oaks at all - just because they have acorns. Not even interesting acorns either. Proper acorns are neat and closer to round. And proper oaks have jigsaw puzzle leaves - Holm Oaks masquerade as laurels that have grown too big for themselves, with leav es that are evergreen and flat - and dull. So, I have other reasons for no longer liking the colours of over-blown autumns but (and I have to admit it) - one is that I'm jealous. Sycamore trees are one of the most common native trees we have in Southern California and I too stare at them, wishing they turned some other color than just brown in the fall! But I agree, they are lovely in their own way. There are some lovely autumn colours around this year Lucy. The new roads or new sections of road have some lovely shrubs and trees planted, that turn a lovely autumn colour. Try the new (ish) bypass around West Stafford - not like the colours we see in pictures from America but very good for the UK. And, Sycamore leaves sail a long way on the wind, similar to little ships. I'ma sicka mora sycamores cos my neighbour's got 3 and my garden is downwind in autumn so they dont have many leaves to clear! And I like your views on holm oaks as secnd class citizens. You could edit Mustard Autumn into 2 good poems; I like your phrases. Is that on the cycle path near your house? I'm sure we walked there back in April. Of course the picture in my mind's eye is all new green and growth, not your autumnal scene! Sheila - It seems odd, thinking of some of the South Carolinan plants which seem so exotic to me having good old Sycamores along beside them! I heard once of a long trail that went (I think) between North and South Carolina, over the mountains, through woods and forests. Is that right? It is on my dream list of walks to do. Sylvia - I expect there are some good autumn colours somewhere. Dorset is so varied! I'm not sure I can get to your bypass trees. Not without taking a bus to Bridport and coming back again! But are they ornamentals? I'm thinking more of woodlands and hedgerows. 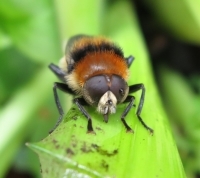 Barbee - they do! That's one of the good things about them. They are such fun to throw around. V.P. The photos were taken in different places. 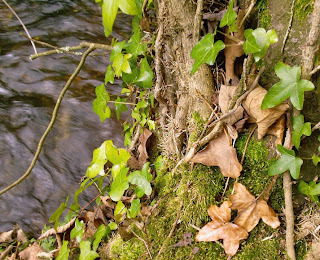 The one with the ivy (at the bottom) was taken by the Frome in Dorchester and the one at the top was taken on one of the footpaths that branches away from it, through the fields. (For people who don't know the area . . . there's a river Frome (with lots of tributaries and meanders) which runs through Dorchester and then there's another one running through Frome in Somerset(where I went for the day with Ceres). 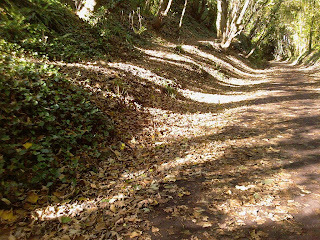 The photo taken in woods, with shadows from the trees running across the path, was taken on the old railway line between Weymouth and Portland. 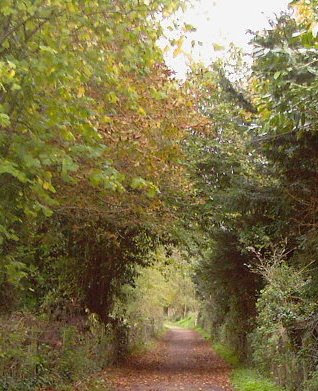 (Now called the Rodwell Trail . . . no rails, no trains!) So was the photo of the Holm Oaks, only further to the south. 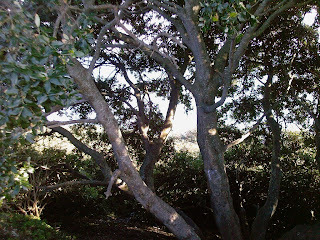 Gordon - When I first came across the Holm Oaks, I thought they were interesting. I've gone off them since because they don't seem to do anything. They don't even wave their branches much in the breeze. Lucy, the trail you are thinking of is probably the 2,175-mile Appalachian Trail, a hiking trail that runs along the ridge of the Appalachian Mountain Range from Maine in the north to Georgia in the south. It takes about six months to hike the complete trail. People start at the southern end in the spring and hike north as spring moves north with them. If they start at the northern end they have to wait a month or two for better weather. Many people have hiked portions of the trail without doing the complete route. My husband and our older son did that years ago. Slept in tents, boiled water, at that altitude it was cool, and the hike is rugged - a challenging experience. Some people do sections of it at a time (as time allows) until they have covered the whole thing. Google Appalachian Trail and there is much info about it. Click on 'Maps' at the top of the screen (top left side on mine), then enlarge the screen (F11 on mine), then you may have to click on the little arrows to get the complete area in view. It is practically the whole eastern edge of the states. You are looking for Maine in the north and Georgia in the south. It is definitely a WOW! Hi Lucy, what a lovely path. I have always loved sycamores, we had them in our neighborhood as a child. The leaves made wonderful tracings in school for our art projects. The Appalachian Trail was the subject of my post before last, Appy Trails to You, with a hike for you to follow along with me. Our fall color so far is a bust, due to the drought now doubt, maybe it is too soon just yet. And thanks so much for the link love, I love that term, coined by Mister McGregor's Daughter.